Judith Handmade Treasures: Sunny Friday! 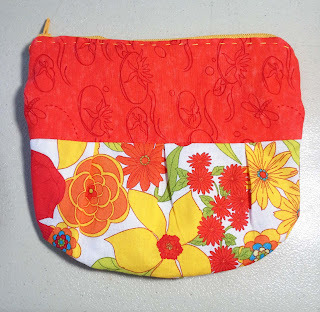 I found a sweet tutorial for a Pleated Pouch Tutorial over Skip to My Lou. I found some scraps in my bin and a zipper. I added an inch to the top piece and lining to enlarged the pouch. Added a tab to cover where I shorten the zipper on both ends, but I was not happy with it and hand stitch along the zipper edge. I have so many projects that are in need of finishing, but needed to put them aside for awhile. Also, Soma is having a Spring Fling Blog Hop over Whims and Fancies. Hop on over and check out all the paper piece patterns that are posted by all the participants. Today is a cool day here down south Texas and a great day to work in my office. I did get a chance to work on my Retro Flowers that I was following along last year over City Stitches. I finished all my blocks, but I was not pleased with the end results. I will post photos later when I add my sashing and borders. Here is a peek of my April flowers that I sent to my secret swap partner for The Inchy Hexagon Flower Swap. I hope they like my flowers I sent. 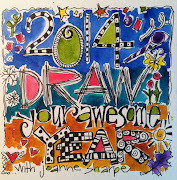 For the creative art in you, Tammy from Daisy Yellow Art has some projects coming up later this year. 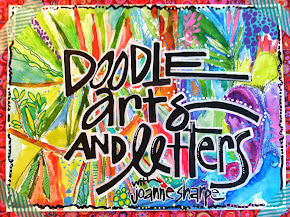 Check out her Art Journaling 101 on her blog if you want to stir up your creative juices. I need a huge jumpstart. My pages are blank and in need of some sketching or color. Many more projects to share, but I hear my WDH downstairs and I could use a break. Keep your thoughts and prayers for the families in West, Texas and the families in Watertown, MA. who are going thru heartbreak.